Sir Robert Bryson Hall II, aka Logic, was born on Jan. 22, 1990, in Gaithersburg, Md. His mother is white while his father is African American. Growing up for Hall was very difficult as a biracial child with a mother who was known for her racist tendencies. His father was hardly ever around and when he was around it wasn’t for a long time. Hall experienced a lot of narcotics, violence, and crime in his household living with his mother. He didn’t meet some of his siblings until he was 10 or 11. They showed him their everyday life being involved in the streets and the dangers of it. From Logic’s perspective that showed him what not to do growing up. Logic attended Gaithersburg High School, where he eventually got kicked out of school for doing so badly, failing every class besides English. Logic moved out at the age of 17 with no money or family to support him. He had to get two jobs to support himself financially. One of the jobs was Joe’s Crab Shack, where they let him perform some nights to promote his music. A friend of his, Lenny or as he calls him, Big Lenbo, let him stay in his basement to pursue his rap career. Logic started going by “Psychological” but decided to just shortened it to Logic. He dropped four mixtapes over the span of four years and each one was bigger than the last. Logic signed to Def Jam Records in 2013, and in October of 2014 dropped his first album “Under Pressure,” that debuted at #4 on the Billboard 200 Chart. On “Under Pressure, he talked about his come up and what his life was like growing up in the streets of Gaithersburg, Md. The following year in November of 2015, he released his second album “The Incredible True Story,” which debuted at #3 on the Billboard 200 Chart. The following year he released one of his mixtapes, “Bobby Tarantino” which contained his first song to make the Billboard Hot 100: “Flexicution.” In 2017, he gained the majority of his popularity and attention through the release of his third studio album “Everybody.” The album debuted at #1 on Billboard 200 Chart. “Everybody” gained a lot of attention for the main reason that it contained a lot of things that artists tend to not like to speak about, such as racism, mental states, inequality, government issues, etc. This being said, his biggest hit to this date is “1-800-273-8255”. The song was about suicide prevention and addressed all the awareness that suicide needs. The song alone increased 50% of calls on the suicide hotline. The song peaked at #3 Billboard Hot 300 and was nominated for two “Grammys”. Since “Everybody” has been released, Logic has released a mixtape “Bobby Tarantino 2” and his fourth studio album “YSIV (Young Sinatra 4)”, both in 2018. Logic states that everything is for the fans and both of the projects were made for the “original” fans who have been with him since the start. He raps about in both being thankful for the fans and appreciating how loyal his fans have been. Hall is going out of his comfort zone as he goes into more areas of the arts, such as writing books and going into the film industry. Recently, he finished his first novel titled “Supermarket”, a book about a man named Flynn who has depression. Despite Logic finishing his first novel, he is also co-writing and starring in a movie titled “Everything Must Go”, produced by JJ. Abrams. Logic has always talked about being biracial throughout his 10 years of being in the music industry and he has had a lot of heat towards it. He promotes the struggles of racial inequality immensely and makes it known that he is biracial despite having an appearance of a white male. One of his songs off of “Everybody”, titled “Black Spiderman”, makes it known of the struggles of being a black man or woman in the everyday life of a American. He shows how proud he is to be a biracial American throughout “Black Spiderman”. Chadwick Boseman, born on Nov. 29, 1977 in Anderson, S.C., is an American actor best known for his portrayals of baseball legend Jackie Robinson in “42”, America’s first African American supreme justice Thurgood Marshall in “Marshall”, and the king of Wakanda, T’Challa, in Marvel Studio’s Golden Globe and Oscar nominated “Black Panther”, “Captain America: Civil War”, and “Avengers: Infinity War”. Boseman’s parents, his mother being a nurse and father a textile factory worker, have supported him throughout his high school, college and professional careers and taught him the culture of his Nigerian and Krio descent, which has inspired him to teach others to be prideful of their culture. In high school, Boseman wrote his first play, “Crossroads”, and based it on the death of a fellow black classmate. Black culture has quite definitely became a major aspect of his career. Boseman also attended the notorious HBCU school, Howard University, where he majored in Fine Arts in directing and raised funds for classmates that could not afford to attend summer programs. His roles as such powerful black role models have inspired countless others to be proud of their culture and work towards making change themselves. 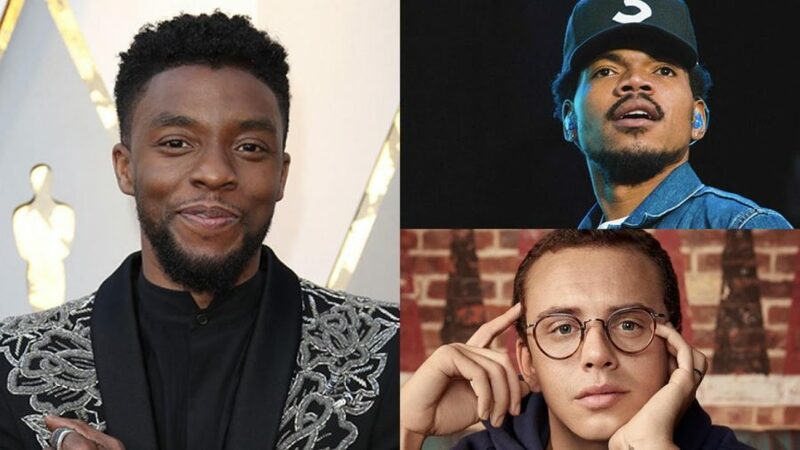 Chancelor Jonathan Bennett, better known as Chance the Rapper, was born Apr. 16, 1993, in Chicago, Ill. He is a well known rapper, singer-songwriter, and a philanthropist. The rapper first began making music in 2011, as he was ridiculed throughout school by teachers and students for his aspirations. His most known album, “Coloring Book”, scored Chance a great deal of popularity along with the eighth spot on the US Billboard Charts. As Chance’s father worked as an aide for former president, Barack Obama, he is well known for being active in political opinions. One of his biggest political statements is his fight against gun violence in Chicago, promoting the “#SaveChicago” campaign. Along with politics, Chance is big into charity and volunteer work. He has donated to many Chicago area schools to help fund programs and works with nonprofits to help the homeless through clothing and food drives. He has donated over $1,000,000 to Chicago public schools and publicly endorsed political candidates that campaign to save education for Chicago, such as presidential candidate Hillary Clinton. Chance is a well known artist in the R&B and rap music industry, but is also known for his charity and political work, with intentions to help his hometown and education around the country.